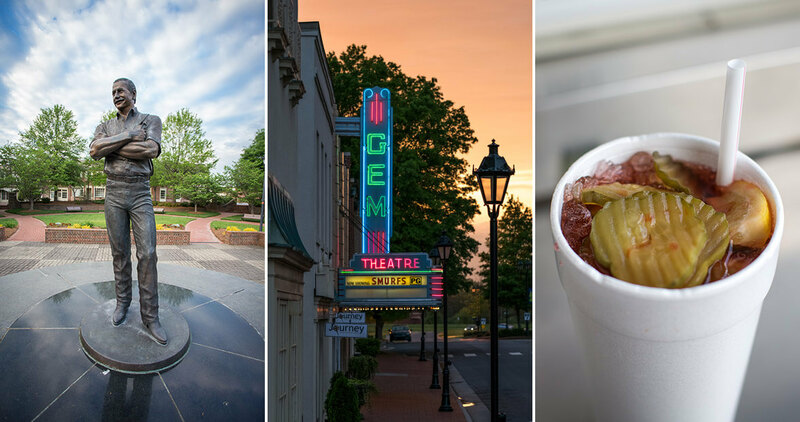 A city shared by Cabarrus and Rowan counties, Kannapolis is at an exciting juncture in its history, too. It’s the only city in the nation that has purchased more than 50 acres of its own downtown while leaders seek to revitalize it. From the community’s first brewery to a new baseball stadium, there’s a lot of exciting change to come in the next half-decade. Until then, we’re honoring the beloved institutions that already make Kannapolis a great place to live — and love. The city’s reputation was built on Cannon Mills, which was the world’s largest producer of towels following World War I. While first-time visitors might expect downtown to be overtaken by factory buildings, the city and its surroundings are much more verdant than industrial. At the city’s center is Veterans Park, a beautifully designed tribute to Kannapolis’ former military personnel who risked their lives defending our nation. From the eternal flame to the bronze wreath to the granite ring of honor, many of the display’s impressive details are reminiscent of larger monuments found in our nation’s capital. Take a moment to reflect by sitting on one of the park’s numerous benches from which you can admire the lush lawns and towering oaks that surround you. The lively Village Park is also close by, and it’s where kids (and kids at heart) can ride a scaled-down replica of an antique train around the park. The park has numerous larger concerts taking place this summer that will complement the smaller ones held at Veterans Park. For a lengthy stroll, take a drive out to Lake Corriher Wilderness Area, located just minutes away in nearby Landis. The park boasts numerous trails in addition to camping and fishing spots. For anyone who grew up in Kannapolis, a true education involved some number crunching. First, you learned how to count the correct way: “1, 2, Earnhardt…” When you got a little older, old enough to take your date out for a spin in dad’s car, you’d round up just enough crumpled dollar bills and coins from the glove compartment for a pair of What-A-Cheeseburgers — maybe some onion rings if you were a high roller — and two Witch Doctors. Since 1964, What-A-Burger #10 has served as a backdrop in countless coming-of-age stories of local teens on restless summer nights. The kids have grown older, but What-A-Burger has remained the same, a place where food is still prepared by hand and delivered to you by the carhop. “A lot of people in Kannapolis grew up when Hardee’s and McDonald’s weren’t around back then, at least in our area,” says Lonnie, Riffle, What-A-Burger general manager. A popular local chain when it first got its start, the number of What-A-Burger locations has withered over the years, but the fanfare around #10 remains as strong as ever — as does the eatery’s signature (nonalcoholic) brew. The Witch Doctor is a fizzy crowd favorite that combines every fountain drink on the menu, including Pepsi and Cherry-Lemon Sun Drop. Topped with three pickle slices and a lemon wedge, it’s sour, sweet, and explanation-defying. Before they were the Intimidators, they were the far less intimidating Boll Weevils. (But who are we kidding, the beetle can leave a cotton farmer shaking in his boots.) When NASCAR driver Dale Earnhardt purchased the minor league baseball team in 2000, its name was changed in order to pay homage to No. 3. Rookies who have played here are often on the fast track to joining the big leagues, including current Washington Nationals starting pitcher Gio González. He was on the Intimidators in 2005 before eventually making his MLB debut in 2008. Current plans have the team playing in a new stadium — what’s being billed by the city as a multi-use “sports and entertainment venue” — downtown by 2020. Until then, sit back and enjoy an evening celebrating America’s favorite pastime and fireworks to follow. See stars of another kind at a place you might not expect to find in Kannapolis: The North Carolina Music Hall of Fame. The museum honors the musical legacies of inductees ranging from Ben E. King to Eric Church, the Avett Brothers to Nina Simone, all of whom have roots in North Carolina. 10 a.m.-noon and 1-4 p.m., Monday through Friday. Healthy portions and healthful food are in Restaurant Forty Six’s DNA. With a name that nods to the number of chromosomes found in the human genome, the restaurant was part of master plan developed by David Murdock, who established the North Carolina Research Campus just a couple of blocks away. Quotes from famous scientists cover the walls, including this one by George Eliot: “No man can be wise on an empty stomach.” Surely the themed décor is inspiring to local researchers who spend their days collaborating on solutions that benefit human health, nutrition, and agriculture. Chow down alongside them on hearty Forty Six Meatloaf for dinner, which is made with a combination of Angus beef and turkey. For lunch, try the imaginative Salmon BLT, which swaps bacon for smoked salmon and is topped with tarragon-caper mayonnaise. 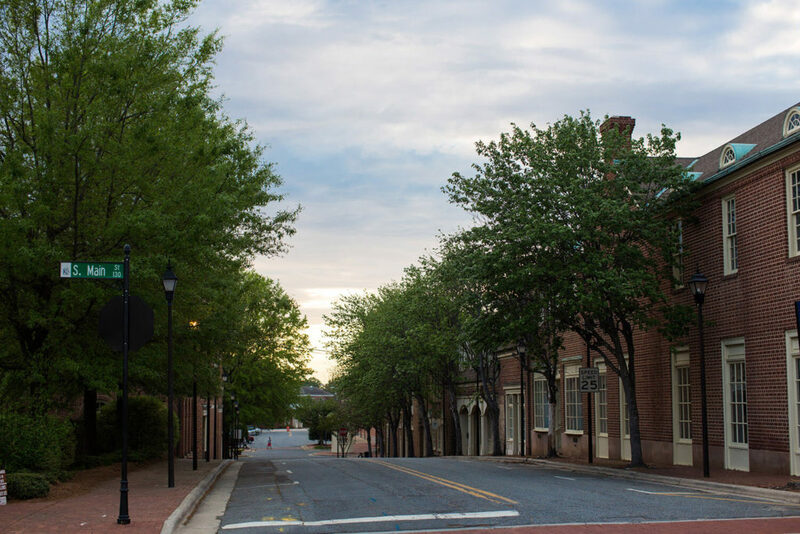 Kannapolis has been around for more than a century, but it wasn’t officially established until 1984. Gem Theatre originally opened several decades prior, in 1936. Based on his research, owner Steve Morris believes that it’s the oldest single-screen theater in continuous operation in the United States. Back in the day, the theater hosted live stage performances before showing a movie. Ask a longtime Kannapolis resident about the Gem Theatre, and they’ll likely tell you about the time they saw Roy Rogers perform on stage with his horse, Trigger. The theater has undergone several metamorphoses over the years. After a fire ravaged the auditorium in 1942 and repairs were put on hold due to World War II, the lobby was used as a space to distribute rationing coupons. At the start of the economic recession in 2007, Morris responded to the “doom and gloom” of the situation by offering free admission on Wednesdays. The theater remains as an affordable place for a family outing; adult tickets come five bucks a pop, and a small popcorn will only set you back $1.75. Through thick and thin, the Gem has taken care of its patrons. “I tell everyone that we’re kind of the caretakers here. The people in this community have a really strong sense of ownership,” Morris says. “This is their theater and the place where they grew up.” Locals know a Gem when they see one.